A history of the strategies, operations, and tactics of the Korean War, timed to coincide with that conflict’s 50th anniversary. Fifty years after the outbreak of the war, publishers and television producers are inundating the public with accounts of the conflict. Standing apart from these opportunistic offerings is British historian Catchpole’s (Clash of Cultures, not reviewed) impressively researched new account. A career officer in the British army, Catchpole successfully combines his professional military insight and keen historical awareness to untangle the Korean War’s complex mix of modern warfare and Cold War politics. 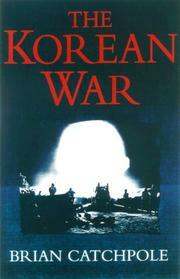 Many historians successfully describe the dramatic opening of the war by focusing on the initial lack of US combat readiness, General MacArthur’s brilliant amphibious landings at Inchon, the resultant UN offensive that almost drove the North Korean forces out of the country, and China’s entry into the conflict. As the war stabilized into entrenched mountain warfare and the UN commitment in Korea dramatically increased, however, these same historians often got lost in the conflict’s shift from military to political objectives. Catchpole avoids this pitfall in two ways: first, he incorporates new material from the recently opened Russian and Chinese archives into his book; and second, he includes several excellent chapters detailing British and Commonwealth service in the conflict. This new material transforms the traditionally messy narrative about the war’s end into a coherent story of international cooperation and bravery in the face of communist aggression. The result is a balanced and accessible history that sheds new light on a complicated war. KOREA, ARE YOU AT PEACE?